Though sectarianism has lately been in the headlines in Egypt, with reports of violence between Muslims and Christians, one recent segment by BBC Arabic reveals one surprising story of unity. For the past 50 years, Iyad Shaker Hana has been teaching children in the southern Egyptian city of Minya. 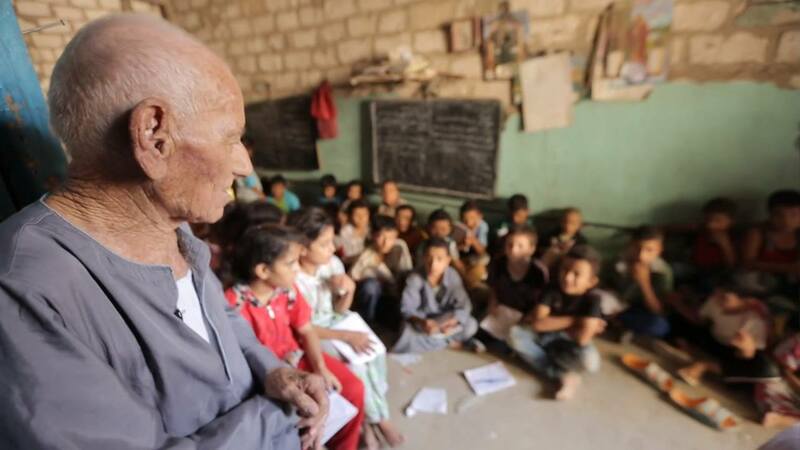 Though the 85-year-old Copt teaches subjects ranging from Maths to Arabic, it is his teaching of the Qur’an to Muslim children that has surprised many on social media. “Ask the elderly, the Sheikhs, and any Muslim in the region if they know Iyad. They will tell you, ‘yes, he taught me, my daughter, my wife’,” says Iyad in the segment by BBC Arabic. “I have been teaching for over fifty years. My students grew up, got married, and brought their children here,” continues Iyad. “When I started, 20 to 30 Muslims and five or six Christians came to me. They learned here and today children form more than 120 families come here. About 70 or 80 are Muslim and 30 to 40 are Christian,” adds Iyad, saying that he teaches them with the approval of their parents. In relation to the Qur’an, Iyad says he explains verses to children and makes sure they are reciting them properly. “I did the same with Christians learning the Gospels and Biblical verses,” says Iyad. What does this cost parents? Just 10 Egyptian pounds says Iyad. When he’s not teaching, Iyad says he feels empty. For English subtitles, click here for a YouTube video.